Currently viewing the tag: "VanCAF"
I’ll be at the Vancouver Comic Arts Festival this weekend! It’s on Saturday May 21 from 10 AM – 6 PM, and on Sunday May 22 from 11 AM – 5 PM and admission is FREE! Here are all the details. Hope to see you there! This year, I’m giving away free Savage Chickens posters and Laser Moose bookmarks. 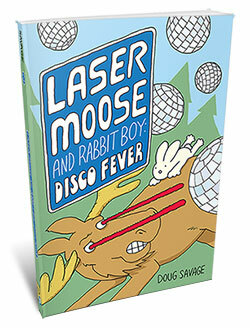 I’ll be giving you a sneak peek at Laser Moose and Rabbit Boy artwork from the new book. And I’ve got cool new Laser Moose t-shirts and other fun stuff. Come visit me at Table C3 in Hall 1. Here’s a map! If you’re at VanCAF on Saturday, you can watch me host A Conversation with Lynn Johnston. Yes, that’s right – I’m interviewing the award-winning creator of For Better or For Worse! The interview will be from 12 to 12:45, and then Lynn will be signing books for a couple of hours. Don’t miss this! Update: The Vancouver Sun interviewed me about Savage Chickens and VanCAF! Watch the video! This weekend, I’ll be at the Vancouver Comics Arts Festival on May 23 & 24. It’s at the Roundhouse community center in Yaletown, and wow it’s going to be good. So many great artists to see, and it’s going to be bigger than ever this year. Hope you can make it out if you’re in the area. And admission is FREE! 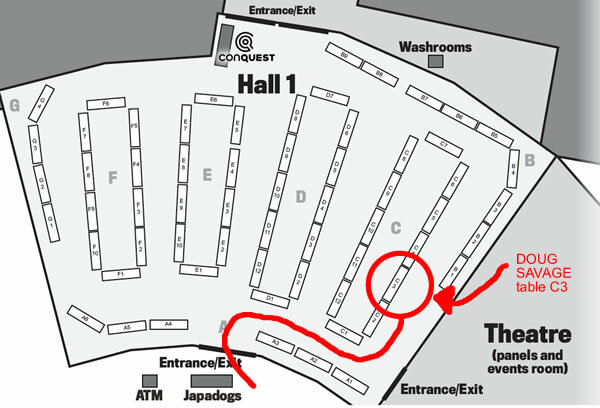 I’ll be at table H9 (see the map below) and I’ll be selling and signing Savage Chickens books, Cat Adventure booklets, and – new this year – Dog Adventures! And I’ll have buttons, mugs, and t-shirts too. Here’s where you can find me this weekend! The Vancouver Comic Arts Festival is this weekend on May 24 and 25, and I’m going to be there! It’s at the Roundhouse Community Centre in Vancouver, and admission is FREE! And there are going to be even more amazing artists this year! Here are the details! 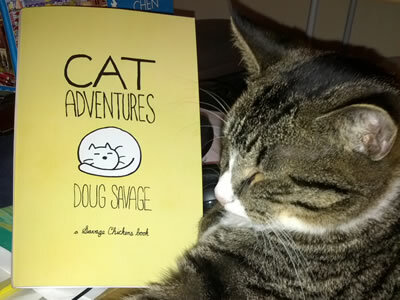 I’ll be at table H2 and I’ll be selling Savage Chickens books, and my Cat Adventures booklets, buttons, and t-shirts. This year I’m bringing kids’ sizes for the shirts, and I’m introducing a new set of buttons! On Sunday May 25, from 11:00 AM to 11:45 AM, I’m hosting a panel discussion called “Comedy in the Comics: How To Be Hilarious”. I’m very happy to have Angela Melick, Ian Boothby, and Kris Straub join me for a chat about how we write funny comics. Come learn our comedy secrets! The Vancouver Comic Arts Festival (VanCAF) is this weekend and I’ll be there! And I’m bringing a bunch of fun new stuff with me. 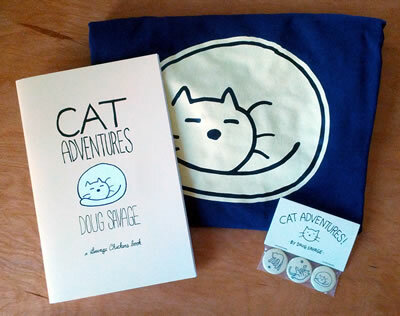 I’ll be debuting a little book of my favourite cat comics (shown above with a sleeping Watson), and I’m bringing new locally-made buttons (shown below) and t-shirts! Admission is free and there will be events all day Saturday and Sunday, including a panel discussion that I’m hosting, called “Breaking Into Comics” on Sunday May 26 at noon. I am fortunate to have the following talented guests on the panel: Ed Brisson, Jason Turner, Jesse Davidge, and Lucy Bellwood. We’ll be talking about how we all got started in this crazy comics business, and hopefully our stories will give you some ideas. If you’re in Vancouver, I hope you can make it to VanCAF – it looks like it’s going to be a lot of fun! Update: Here’s a link to a recording of the Breaking Into Comics session!